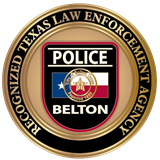 The Belton Police Department is investigating a shooting death that occurred before 5 a.m. this morning at a home in the 800 block of Carla Kay Dr. It is still early in the investigation, but police are looking for two black men in connection with the shooting. A frantic witness called 9-1-1 at about 4:54 a.m. and reported the shooting. When police arrived at the home there was evidence of forced entry, and a man was found dead in the master bedroom area. He had been shot multiple times. Police have not yet released the man's age or name, but plan to do so as the investigation continues. The Bell County District Attorney's office is assisting with the investigation.